If you don't have a 3DS yet and are willing to spend $200, the New 3DS XL is a pretty good option. (The non-new 3DS XL costs $175; the smaller 3DS goes for about $160). You're future-proofing a bit, and you're getting some better control options and stereoscopic 3D tech than you would if you got the older models. The New 3DS' new c-stick allows for dual-analog controls and surely will be programmed for that by developers who believe there are enough New 3DS owners to justify a control scheme that wouldn't work on a standard 3DS. For the moment, though, the c-stick nub can pretend to be a "circle pad pro," which was an add-on that put a second analog circle-pad input on the right of the 3DS. There aren't many games that supported the circle pad pro (here's a short list), but it's nice that the New 3DS will at least let players play those games' alternate control schemes without an added peripheral. The New 3DS tracks the position of your mouth and eyes in order to calculate the proper angle at which to display the system's glasses-free stereoscopic 3D. It can do this constantly and on the fly, which means that it'll transmit a clear 3D image to you even if you begin to rock your head or the system. This results in more stable 3D effects that are only occasionally baffled if a second person's face gets close to yours or if you're moving your head while wearing glasses. Even then, the system figures things out quickly. It's a lovely improvement. "It looked so good that it made me want to apologize for not having the 3D functions work this greatly when we first released the Nintendo 3DS system. Of course, such technology was not available when we released the original Nintendo 3DS, so it was impossible to integrate it at the time. I hope people will forget their expectations of 3D from the past, and replay on the New Nintendo 3DS systems the 3DS games they played before. For reasons that reek of Nintendo cost-cutting (from the company that eliminated the headphone jack from their second Game Boy Advance! 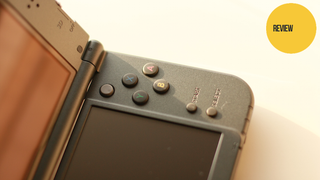 ), the New 3DS XL does not come with a power cable. The new handheld is compatible with the AC adapter cable from the 3DS and 3DS XL, but if you don't have one of those, then you've got to buy a $10 cable. Nintendo has been leaving power cables out of their hardware packages outside of North America for some time, but that doesn't make it any less strange or annoying. It's oddly difficult to buy an official Nintendo AC adapter, but our friends on the Gawker Media Commerce team have some power cord suggestions.